A capacitor in the freezer's circuitry can overheat, posing a fire hazard. In addition to the 18 incidents reported in the November 2010 recall, which included four reports of fires with minor property damage, Haier America and CPSC have received 27 additional incident reports. This includes three fires that caused substantial property damage. There have been no reports of injuries. 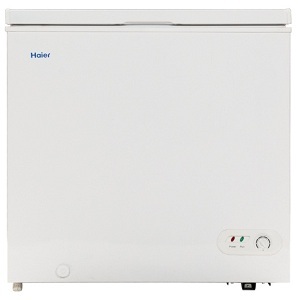 Haier model HNCM070E was sold by regional and local retailers nationwide and online at Amazon.com, Walmart.com and other online retailers from September 2009 through October 2011 for between $180 to $200. Haier model ESNCM053E was sold primarily on Amazon.com and other online retailers from February 2010 through March 2013 for between $200 to $290. The Black & Decker model BFE53 was sold exclusively at Walmart nationwide and at Walmart.com from September 2009 through September 2010, for about $150. Consumers should immediately unplug their freezer and contact the company to schedule an appointment for a free repair to the freezer. This recall involves the Haier® models HNCM070E with 7.0 cubic foot capacity and ESNCM053E with 5.3 cubic foot capacity, and Black & Decker® model BFE53 with 5.3 cubic foot capacity white chest freezers. "Haier" is printed on the upper-left corner of the freezer, or "Black & Decker" is printed on the front upper-right corner of the freezer. "Haier" or "Black & Decker," the model number, the unit's serial number and other information are printed on a rating label at the top center of the back of the freezer. The recalled Black & Decker model BFE53 freezer also has a label adjacent to the rating label with the UPC number 896603002660 printed on it.